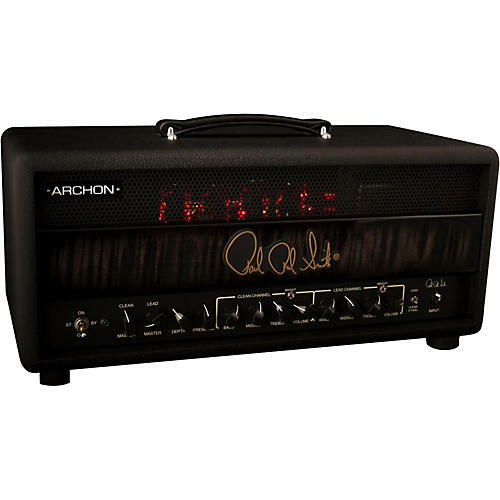 The PRS Archon amplifier has the impact and flexibility suited for today's heavy music. Greek for "ruler" or "lord," the PRS Archon is a commanding and versatile 2-channel amp with aggressive overdriven tones and sparkling cleans with plenty of headroom. The Archon's lead channel was designed with five gain stages before the master volume, delivering full, lush distortion. The clean channel provides ample headroom with rich clear tones that retain clarity even at high volume and are an excellent platform for pedals. The Archon has remarkably responsive tone with incredible note separation, whether you're playing on the clean channel or chugging on the lead. Utilizing a ˜no flash or trash' approach, the Archon's control layout features volume and tone controls for each channel, a global depth control to add a thunderous low end, and a presence control to effect the high-end chime. A half-power switch allows players to choose either 100 or 50 watts of output adding to the Archon's extreme flexibility. 21.570" x 10.5" x 10"